It’s time to report in on the Deacons of Deadwood’s 13th Annual Charity Ball. Better late than never. To recap, the Gala was held at the Bayou City Event Center in Houston, Texas, September 20, 2014. Frank and I were the guest of our friend John Beck. 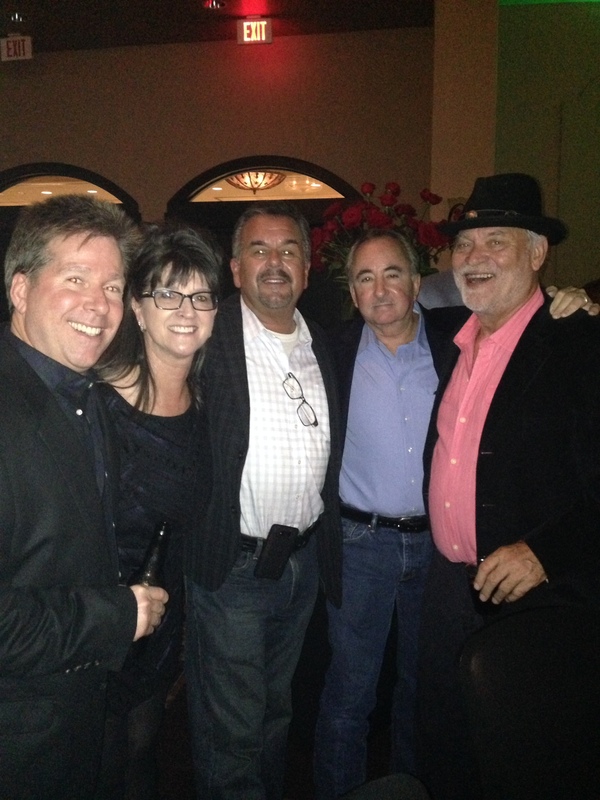 Here’s a shout out and Special Thanks to John and Sharon for inviting us to this awesome event. Where to start … Well, this was definitely a Biker Formal. The dress code as posted on the DD website held true to course and I liked that. No alienation. Doing your own thing was welcomed and embraced. Jeans to cocktail dresses, leather vests and cut-offs, dress it up or dress it down. No matter, no muss, no fuss in the dress code department. It was refreshing! We spent the evening with a group of long time friends who we’ve ridden motorcycles with since the Richmond Ruffian days and you all know who you are. It was like old home week. We’ve all grown older but wiser (well that might be going a little too far!) Here’s a special shout out to you all. Hey! 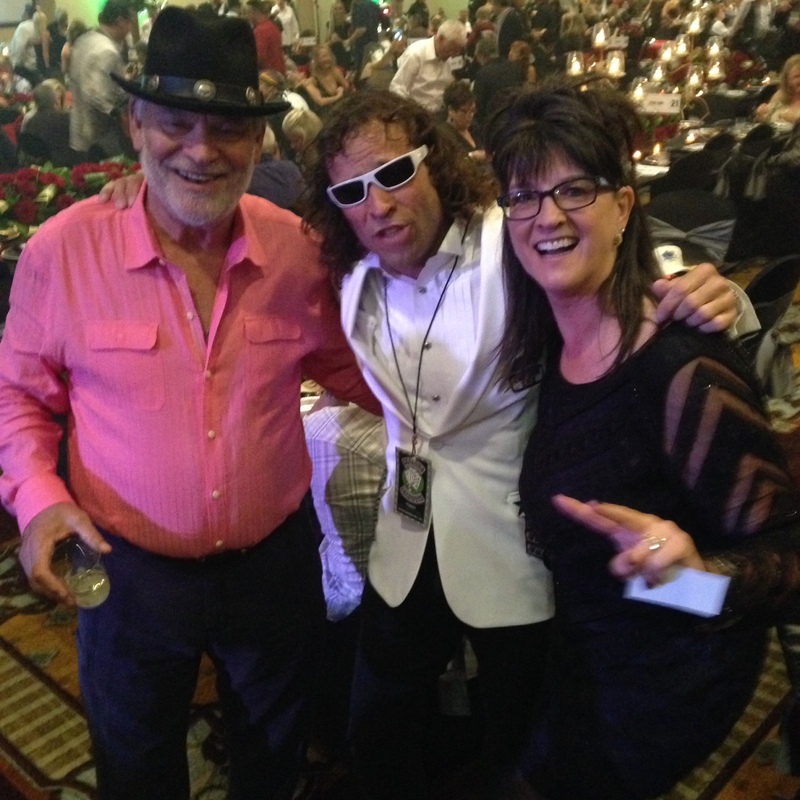 Frank and I had the pleasure of meeting Kirk Lane aka Captain Kirk, President of the club. Ironically, it turns out he lives in our neighborhood. Small world, isn’t it! 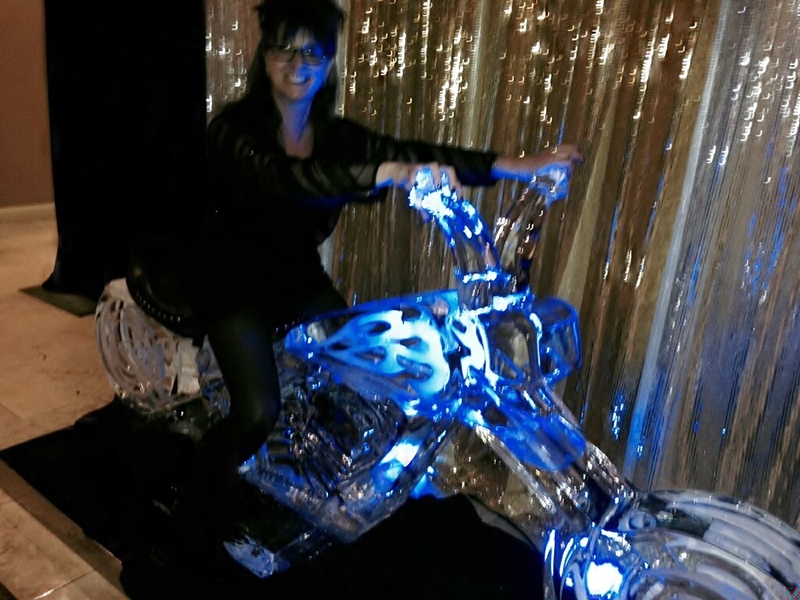 In the lobby was a blue iced sculpture of a motorcycle. It was a brilliant display and appropriate for such an event. It also served as a great photo opportunity for those who didn’t mind the chill. I must say I it was an interesting ride. The food was provided by Demeris Bar-B-Q and what a fine spread they did serve. The main course was your choice of filet of beef or chicken accompanied by Parmesan asparagus and green beans with carrots, all of which were beautifully presented. The also offered a to die for baked potato bar which included russet mashed potatoes, purple Peruvian mashed potatoes and sweet potatoes. The choices for potato toppings were plenty. They included the regulars – bacon bits, sour cream, shredded cheese, chives, as well as the not so regulars – walnuts, marshmallows, brown sugar, marsala mushroom gravy and a light cream gravy. All I can say is delicioso! The beverage lines were long but allowed opportunity to visit with your fellow thirsty Gala goers. I met Amy and Jan – sorry I didn’t get a photo. I happened upon them in both the food and beverage line. Here’s a shout out to them both! Hey Amy! Hey Jan! It was nice meeting you. Entertainment was energizing. 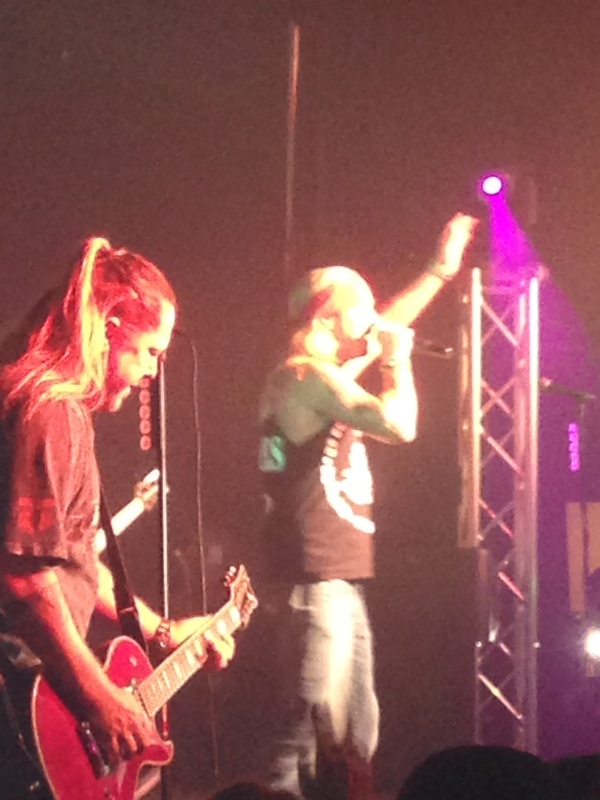 Bret Michaels was phenomenal to say the least. His 1980’s hit, Welcome to the Jungle had the crowd on their feet. The room was lit up with cells phones clicking as the party goers snapped photo after photo. I admit, I was one of them. His rendition of Lynyrd Skynyrd’s, Sweet Home Alabama and Dobie Gray’s Drift Away had the everyone rocking and swinging. This was my first “Bret Michaels concert” and I loved him. Sorry for the awful photo. One hundred percent of the net funds raised at this event are donated. The Charity Beneficiaries this year included Devereux Texas, Boys and Girls Country, Child Advocates, Camp Quality, Archway Academy, Center for Success, Mission Bend Christian Academy, Dream League, Epilepsy Foundation, Workshop Houston, Gulf Coast Big Brothers Big Sisters, Addi’s Faith Foundation and Smilesgonewild. I hope I didn’t leave anyone out. Much of the proceeds come from the sale of VIP tables, corporate sponsors, donations and a silent auction. There were plenty of auction items to browse. My favorite was the Bruce Springteen photo. A Harley Davidson motorcycle was auctioned off, as well. As it goes, all good things must come to an end and the Charity Ball was no exception. I hope the financial success of this event was as great as the time had by all who attended. My hat goes off to the Deacons of Deadwood MC. What you are doing for the community is commendable and does not go unnoticed. A special Thanks to you all from Motorcycle Momma aka Wonder Woman. I already look forward to next year. This entry was posted in Blog, Uncategorized and tagged Deacons of Deadwood, Demeris Bar-B-Q, harley riders, lady bikers, motorcycle charity, motorcycle event, Stubbs Harley Davidson, women bikers. Bookmark the permalink. « Who are The Deacons of Deadwood MC?